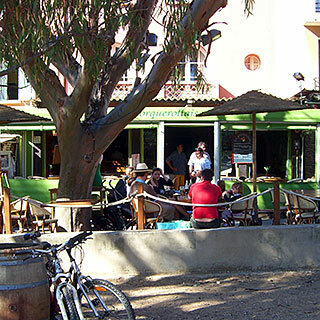 Hyères-Plage is a fairly small place, but there is a decent selection of cafes and restaurants, and other nearby places to visit. 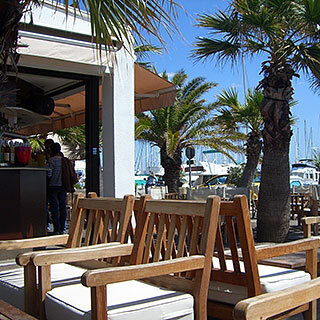 This page contains reviews from April 2008 for Hyères-Plage, Giens and Ile de Porquerolles. A place this small, even a seaside place, would not normally have so many decent restaurants. 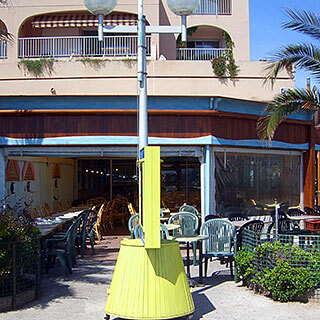 Hyères-Plage benefits from the relatively restrained marina, which creates demand for slightly upmarket restaurants, and does not have crowds of tourists, which creates demand for lots of cheap rubbish. This makes eating out less risky than somewhere like Nice, which is likely to have more in both the ultra-expensive and cheap-and-nasty categories. Le Carré is a lounge bar whose big terrace is just made for sitting around drinking cocktails: wooden furniture with cushions, decking, bar on the terrace and palm trees. The cocktail menu is good too, with Ti Punch, Caipirinhna and five kinds of Mojito. This place is not cheap - cocktails are €7-11 - but that is the price of bliss. 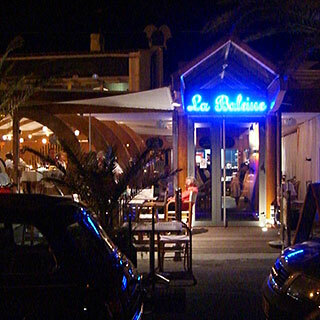 La Baleine is perhaps the most upmarket restaurant in the marina: classy, with excellent food, but not especially traditional or pretentious. The service was great and the amuse-bouche tasty and interesting enough to whet our appetite and make us look forward to our meal. The menu focuses on fish, unsurprisingly, so we had fish soup and seafood cous-cous, which we thoroughly enjoyed. 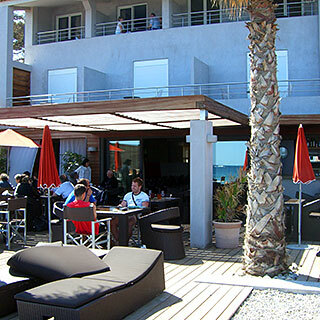 Hotel Bor is all about the terrace on the beach, which features comfy loungers, arm-chairs and the most perfect sofa-parasol combination in the front corner that is only about three metres from the sea. On a hot and sunny afternoon, this was the perfect setting for the obvious choice of pastis, which came with a smile and plenty of water. 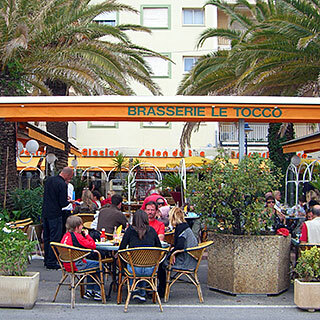 Brasserie le Tocco is a very serious kind of place with a huge number of tables and the kind of efficient professionalism to pull it off. 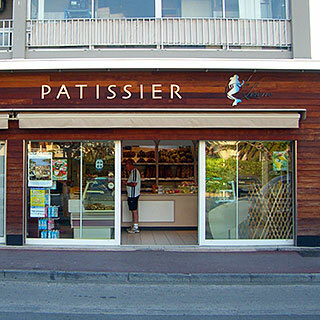 It was just a shame that they did not have croissants for breakfast on our first visit. There is something slightly tacky about the terrace decor, but the food was straightforward and worth going back for. We just managed to get a table during a packed Sunday lunch time, and had very tasty and good-value seafood pasta dish of the day, and a huge fish soup with lots of bits. 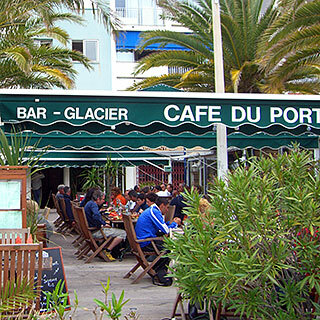 Cafe du Port put us off with its gruff service at first, but we went back for food anyway because of the interesting menu and the attractive and comfortable terrace. The menu features an unfeasible number of salads, with other intriguing dishes such as several variations of steak tartare. We enjoyed a good salad and a delicious steak tartare that was fried on the outside to make it look like an oversized beef burger, but deliciously cold, raw and seasoned inside. The service was friendly in the end too. 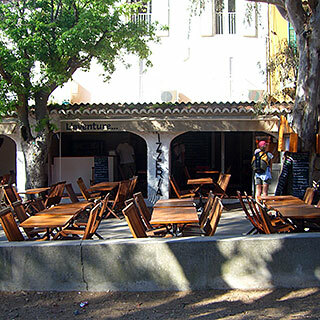 La Vague is not especially appealing, mainly because it tends to remain empty longer than its neighbouring cafes. However, they do have a selection of pastries for elevenses, which is more than some of the others can say, so we did enjoy a brief visit one morning. As Northern European visitors, we did not want to eat out every night because it is so nice to have a simple meal on the balcony with some good ingredients. The small 8 à Huit has just what we needed: convenient opening hours (0830-2000 Monday to Saturday, 0830-1300 and 1700-1900 Sunday), a reasonable selection of good wine, fresh bread morning and evening, and delicious cold meats and cheese to put on the bread, such as Corsican wild boar pate, and various kinds of smelly runny cheese. The baker is an excellent place for take-away lunch, if you do not want to sit around all day. As well as bread, there are various tasty quiches and savoury food, as well as the expected great selection of sweet pastries. The baguettes are slightly better than the ones at the supermarket, so you may want to make two stops if you plan to take bread and cheese or pate on your picnic. We spent very little time exploring the old town, on account of it being so far from the beach, but we did find a couple of places worth going to. 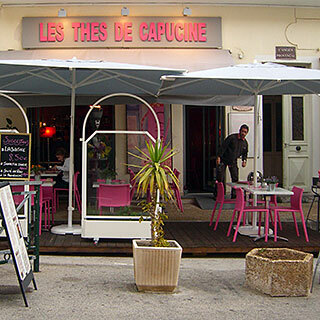 A rare find, this cafe’s terrace, in the middle of a heartbreakingly pretty square, actually features a few sofas, which are both comfy and pink. The pink goes with the flowers on the wooden tables and the interior's colourful decor. While the menu is mostly about ice-cream and other sweet things, there are also sandwiches. I just settled for a refreshing citron pressé. Giens is a short trip from Hyères, even accessible by bus, and a great basis for a day hiking around the peninsula on its gorgeous Southern coastal footpath. The tiny high street has several great places, which means you could also forget the hiking and just sit on a terrace all day. There is also a baker, if you prefer sandwiches and cake for take-away lunch. 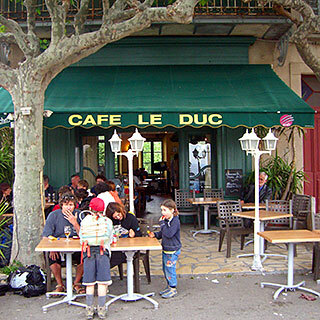 Café le Duc is a proper cafe-bar, with a great atmosphere sitting around having a drink. Even better, there are bonus points for the big tree that shades the terrace outside, the terrace's prime position for seeing what goes on in the village and the front of the church as well as a glimpse of the sea to the Soutch. This cafe is more of a find for its decent environment inside, unlike so many French bars that have a good terrace but are horrible inside, and this one even features a big comfy sofa. This is not the kind of modern cafe that you expect to find in a small village: bright colours, fancy tea, and funky furniture - more interesting than the usual terrace. We like this one because it manages to pull it off, without being tacky or half-hearted. The vast tea selection is interesting too and the mint tea we tried was very nice. 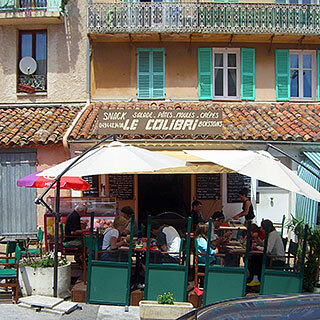 We stopped for a brief lunch at Le Colibri, which presents itself as something halfway between snack bar and restaurant, and were pleasantly surprised by how well executed the simple menu was. The omelette and chips was unpretentious and excellent, with a simple green salad whose dressing was just right, and was just what we needed before an afternoon hiking around the island. All in all, a much more relaxed and pleasant experience than having lunch in one of the busier places in the area. The island of Porquerolles seems well able to attract huge crowds of day trippers on a sunny public holiday - almost exclusively French, with Italians and Swiss making up most of the last few per cent on the day we visited. The foot-passenger ferries in the morning deposit literal boat-loads of people in the island’s single North-coast village, many of whom rent moutain bikes and head off around the island. We started by walking to the Southern coastal footpath, where you leave almost everyone else behind, especially once you head uphill and onto footpaths that do not allow bikes. The island is rightly popular, because its coastal paths are impressive, as are the views from the various high points around the island. 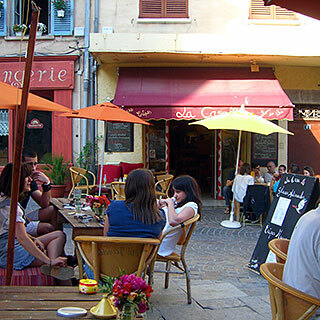 The cafes and restaurants in the village, however, are another story. 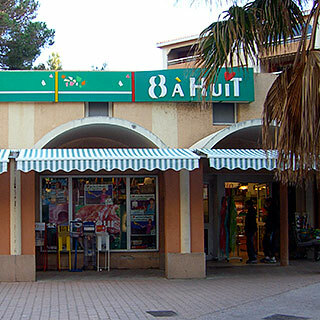 L'aventure has to be the worst pizza place on the Côte d'Azur, and was the single biggest mistake we made all week. The staff were all clearly incompetent, and their rudeness and bad temper were only overshadowed by their inability to organise themselves and serve customers without constantly arguing with each other about whose fault the latest disaster was. We might have been able to ignore this dramatic back-drop, had it not quickly become clear that we were going to have to wait an extremely long time for two pizzas, while starving and desperate for food. We looked on helplessly as tables who were seated before us got pizzas that went cold while cutlery failed to appear, and where half a group finished eating before the other half got their food. When our food finally came, one of the pizzas was completely burned, so that every mouthful tasted of charcoal - a complete waste of the most expensive pizza on the menu. This took the restaurant beyond the kind of incompetence that will hopefully put them out of business before the year is out, and into the realm of the kind of crooked business practices that give a whole town a reputation for conning tourists. Unfortunately, we were so hungry at this point that we could not consider sending it back, and certainly did not have all day to waste, so we cut our losses, ate what we had and left as soon as possible with a very bad taste left over. We started the day with a coffee outside Le Porquerollais, since it is about the furthest from where the crowds arrive on the ferries, and spent a little while enjoying its terrace on the edge of Place d'Armes, which functions as a sort of local playground and 'rec' for ball games. Even without much to compare it too, this place seemed pretty friendly and pleasant.